Finding the best home safe can be difficult. There’s so many options to consider when deciding which safe to buy. What's worse, the wrong decision can have disastrous consequences for you and your family. The secret to successfully choosing a safe that’s both secure enough to protect your valuables and easy enough to use on a daily basis. If none of these are suitable, below these home safe reviews, I’ll walk you through four easy steps that will ensure you find the right safe for your needs. 12.1 How to Choose the Right Safe for Your Home? Pros: Solid steel construction, 12 gauge steel, 3 live/dead 1" thick steel bolts, 2 hr fire rating. Cons: Has not been factory tested for water resistance. Most security or gun enthusiasts know Mesa Safe because of their top of the line gun safes and commercial safe deposit boxes. However, for those who don’t know, Mesa Safe Company is also at the helm for building several high-end, top of the line domestic security safes. The model we’re reviewing today is the Mesa MBF1512C – an all steel burglary and fireproof safe. 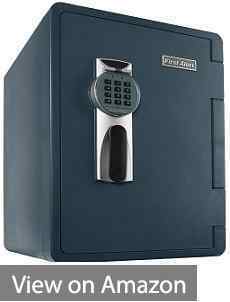 Priced around $450, it is probably the best safe for your home under $500 on the market right now. It separated itself from a strong field of contenders to be our pick for best overall home safe – best application for safely storing most valuables including jewelry, cash, documents, photos and digital media. Like all of Mesa’s products, the MBF1512C is constructed from all steel, with a storage capacity of 1.7 cubic feet. Therefore, weighing a total of 139 pounds (without anything in it) would require more than one person to carry. In addition, the door is made from 41⁄2 inch thick reinforced solid steel and the remaining body from 1 3⁄4 inch thick steel. It also has 3 solid steel, 1 1/2 inch, locking bolts and deadbolts. The interior of the safe features a fully upholstered shelf, walls, and door panel using the fire-resistant material. The MBF1512C is factory tested to withstand impact from a two-story fall without cracking or opening and includes a drill resistant hard plate and Punch-activated re-locking system. As a result, successfully breaking into the Mesa MBF1512C would not exactly be a walk in the park regardless of how (or what) you tried. It should be noted, that a well skilled and motivated burglar with the right tools could eventually open any safe with enough time. Therefore, perhaps if using an angle grinder to cut into the side, for instance, one could bypass the door to get inside the Mesa MBF1512C. Nonetheless, I’m confident enough in this safe to securely store smaller valuables and provide adequate deterrence from attempted break-ins, that you really get your monies worth. The MBF1512C has a 2 Hour U.L. Classified Fire Rating by Underwriters Laboratories (UL), America’s largest provider of product safety certification. In other words, it has been third-party verified to withstand up to two hours of being on fire with the outside temperature reaching a maximum of 1830°F/998°C, while maintaining inside temperature below 350°C/177°F. In the event of a house fire, you can rest assured that your valuables such as money, jewelry, important documents, and even paper will not get destroyed in the fire, assuming the fire doesn’t take longer than two hours to contain or put out. With a U.L Classified Fire Rating double that of second place, Sentry Safe SFW205CWB, and that of third place, First Alert 2.14 C.F, this is just another reason why the MBF1512C got our pick for the best fireproof safe. Unfortunately, the MBF1512C has not been independently verified or factory tested for water resistance. However, when it gets hot enough, for example during a house fire, the MBF series safes are designed to expand and become airtight. In order for a safe to provide resistance against fire, it must be airtight, in which case, any water used to contain and put out a house fire is unlikely to cause any water damage to the contents inside. Mounting the MBF1512C is a pretty simple and straightforward process, partly thanks to the four factory pre-drilled anchor holes and anchoring kit that comes with this safe. Doing this will make it even more difficult to move and carry away the Mesa safe, further improving the degree of security offered by this safe. In conclusion, if you’re after a safe that offers protection against both fire and burglary, the Mesa MBF1512C is sure to please. It is perfect for most home and domestic needs, and investing in one will probably be the cheapest home content insurance you'll ever pay. The Mesa Safe MBF1512 is available in both combination and electronic locks! If you prefer an electronic lock over a combination lock, take a look at the MBF1512E. The “C” at the end of the model number indicates that is a combination lock and the “E” indicates that it is an electronic lock. If you’re after a larger safe, check out the MBF2020C (3.3 Cubic Feet) MBF2620C (4.1 Cubic Feet). Pros: Requires two people to carry, easy to use dial manual lock, six 1" locking bolts. Cons: Requires use of desiccant and monthly airing out of moisture. The SentrySafe SFW205CWB, Water Resistant, Home Fire Safe has a steel outer shell and heat shield to provide reliable protection. Independently verified to protect against fire and flood helps bring peace of mind that important paper and digital documents, as well as other valuables, are safe in an emergency. It also features a combination lock that is reliable and easy to use, pry-resistant hinge bar, 6 large, 1-inch bolts and is made from steel to help protect against theft. The deep multi-purpose tray and key rack help keep even the smallest of valuables organized. The SFW205CWB has a UL Classified 1 Hour Fire Rating. This means that it can withstand temperatures of up to 1700°F/927°C for up to 1 hour while maintaining the safe’s interior below 350°F/177°C. The degree of protection this safe offers against fire has been further tested and verified (UL Classified) using explosions. After exposure to a flash fire in a 1000°F/1093°C furnace for 30 minutes, the SFW205CWB still did not explode or rupture.the safe. In the event of a fire, 1-hour fire protection should be plenty of time to keep your valuable from getting damaged. This is especially relevant for those who don’t live in a remote area, and where the fire department’s response time is relatively quick. The BIGGEST BENEFIT of the SFW205CWB UL Classified 1 Hour Fire Rating and ETL Verified 1 Hour Digital Media Fire Protection is the wide range of valuables you can secure and have peace of mind knowing they’re protected against fire…such as documents, money, and jewelry (EXCEPT pearls), as well as CD, DVDs, memory sticks and USB drives. It is important to note, the fire resistance requires the use of a desiccant inside the safe to protect items from moisture emitted by the fireproofing. To prevent moisture building up inside and maintain good home fire safe practices, the door should be opened periodically. ETL verified water resistant in up to 8 in of water for up to 24 hours. This meaning that in the even t of a flood, this safe can keep your valuables from water damage while submerged in 8 inches of water for up to 24 hours. The burglary protection features of the SFW205CWB includes the safe’s steel construction, 6 live-locking bolts, pry-resistant hinge bar and bolt down hardware (included). The SFW205CWB doesn’t come with any factory pre-drilled holes, yet they’ve included anchoring hardware; so bolting down requires drilling two holes in the designated spots inside the safe first. This isn’t something that’s easy to do, and unless appropriate water tight sealant is used, it will compromise the safe’s water protection. Another concern is in relation to pry-resistant door hinges being on the outside of the door, and the extent to which this may compromise the safe’s protection against burglary. Arguably, if it weren’t for the six live-locking bolts, it probably wouldn’t take all that long for someone that knows their way around the right blow torch to bust the sucker open. Fire impact (ETL verified), the safe withstood being heated to 1550°F/843°C then dropped 15 feet onto rubble, cooled, inverted and heated again to 1550°C/843°C for 30 minutes. However, it is recommended that with large fire safes such as this, ideally, you would place it on the ground floor so if the floor were to collapses, it couldn’t fall on anyone causing injury, or worse, death. This model has a 6-digit manual combination lock. While the master combination can NOT be changed, by adding a second combination either will open the safe. Instructions on how to do this are set out in the manual. I prefer the SFW205CWB model’s dial combination lock over the SFW205GQC model’s digital lock because it is more affordable and reliable as it isn’t susceptible to electronic failure or malfunction. However, if you’re looking for the best home safe for documents and also provides digital media protection, you cannot go past the SFW205GQC model. The SentrySafe SFW205CWB isn't ideal for protecting against the threat of burglary and theft. The safe is better suited with those who are more concerned with protecting valuables against fires and/or floods, rather than of theft. Don't get me wrong, this safe has the potential to deter thieves and make them think twice about whether it's worth the trouble. However, if you live in an area that has a high rate of break-ins, this safe really isn't for you. The SFW Series Home Safes Comes in a Variety of Different Lock Types! If you’re not set on the dial combination lock of the SFW205CWB, but instead prefer a digital electronic type lock, check out the SFW205GQC. If instead, you need more like a small house safe, then take a look at the SentrySafe X055. Pros: Digital media protection, portable, concealed, pry-resistant hinges, digital lock, override key. Cons: Requires water tight sealant when mounting so waterproofing is not compromised. The First Alert 2096DF fire and waterproof home safe are quite large safe, able to store a lot of items while keeping things organized with the two interior shelves it has. There also the option to purchase it with the Handy-Hauler wheels, similar to those you see on travel luggage which is meant to make this safe easy to move if necessary. It is also water and fire proof, ensuring the safety of the contents of you safe in the case of flood, fire and other disasters. The safe is also equipped with both digital and key locking features. This is very handy in the event that the batteries run out or the keypad malfunctions, or if a second person needs to have access to the safe. This digital safe has a 1700°F/927°C heat and fire-resistance for up to an hour, all the while maintaining a 350°F/177°C internal temperature. The 2096DF safe is fitted with waterproof seals, keeping the interior completely dry and free of moisture, even when completely submerged. The Ready-Seal bolt system allows the safe to be fixed to the floor with a water and fire resistant seal. This First Alert model is a popular choice due to its Ready Seal design, allowing it to be easily attached to the floor to prevent it from being stolen. It has a four digit combination lock as well as the key override. It also comes equipped with hidden, pry-resistant hinges. First Alert Digital Safes are made of an incredibly strong resin, allowing the safe to be moved, abused and even survive break-in attempts with minimal damage. It has four solid steel locking door bolts and the patented Delta pry-resistant hinges, both key features for durability and thief resistance. At a sturdy 145 pounds, this is no light weight safe. At 2.14 cubic feet, this is a larger than the average home safe. It has plenty of room for important documents, digital files and valuable items. 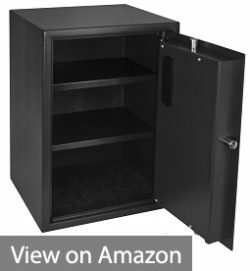 Featuring two moveable shelves, this fire and waterproof safe can accommodate almost any home or small business security needs. This safe has an adjustable shelf, key rack, an adjustable and removable hanging file folder shelf, and a door pocket to keep the contents organized and easy to locate. The First Alert 2096DF is very competitively priced when compared to similar fire and waterproof home safes. It also has a number of additional features, such as the bigger size, organizational features, and ease of movement that make it a fantastic value. 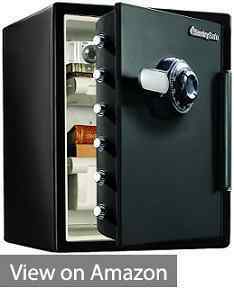 Ranging in price from $150.00 to $200.00, this safe is a great investment for any home or small business. This safe is pretty much everything you need to keep documents, digital files, and valuables safe at home. It comes with a handle and wheels so if portability is something you’re concerned with then this will be an easy choice. This home fire and waterproof safe from First Alert also has a cinch to seal to the floor, after removing the wheels with a screwdriver, therefore making it nearly impossible for thieves to move. The safe comes with both a preset factory combination and 2 keys, and also features a keypad back light. Furthermore, it comes with a 5-year factory warranty. First Alert Have a Variety of Different Sized Models of Fire and Waterproof Home Safes! Other similar ones include the First Alert 2087DF 0.94 Cubic Foot Safe, the 2096DF (1.31 Cubic Foot), and the First Alert 2575DF, which is a 2.77 Cubic Foot home fire safe with a two-hour fire rating. Pros: Can hold several handguns plus ammo and other mid-size valuables at once, interior light, thicker gauge steel than other safes in same price range. Cons: Has not been factory tested for protection against fire or burglary. The Viking Safe VS-50BLX has achieved an average of five out of five stars by user ratings for the best biometric safe. Viking Security Safe is a brand which is stationed the USA and recently started in 2014. Viking is a newer brand which has gained a lot of popularity after the launch of several biometric safes that have been anything short of amazing. The people have spoken, and The Viking Safe VS-50BLX has stood out amongst its peers as being one of the best safes in its class. Read on for my safe security reviews of the Viking biometric Safe VS-50BLX. The Viking biometric safe’s high-security features make this safe a tough one to crack, with its internal 500 DPI biometric fingerprint scanner and digital keypad for ease of entry make this safe a balance of quick access and unyielding security features. What I love about this safe is the speed you can get it open with the biometric scanner, it may not seem important to the average safe owner, but if you’re a gun owner and want to keep your weapons safely locked up, the Viking allows for safe keeping and fast entry so you can keep your loved ones and yourself safe. The Viking also features two anti-pry insertion slots and a proprietary motorized deadbolt locking system, which in the event of an intrusion, deploy two automatic, 20-millimeter steel bolts into place. No one is getting in this safe. Here’s where we run into the cons of this safe, Viking didn’t incorporate any fire-resistant materials into the internal construction of the safe walls. There is room to grow when it comes to fire resistant safety with Viking safes. However, if you are looking for a fire resistant safe, this one isn’t for you. When it comes to a safe, you need fire resistance when it comes to any house or business fires. With regards to water resistance, Viking fails to accommodate for this feature. When it comes to living in an area that is susceptible to flooding and leakages with pipes, Viking isn’t dependable. When you have very important files and documents needed to stay wet-free, the mounting of the safe doesn’t refrain from water damage. On the plus side, with Viking Safes have accommodated for other features such as durability, flexibility, and protection. This Viking security safe is built with the utmost quality and safety in mind. The outer housing material and door are dense enough to withstand the most determined intruders prying attempts. Although the safe doesn’t weigh much at 48 lbs. The outer housing and door feel like they could withstand a battering ram or a rocket blast. The VS-50BLX is made of laser cut, pry resistant steel, welded seamlessly and coated with Vikings military grade, scratch resistant finish, making this one hell of a tough biometric gun safe. When it comes to Viking VS-50BLX, they do not let you down storage-wise. It has three adjustable/removable shelving units, so if you only want one shelf, you are more than welcome to remove the others. One thing that this safe doesn’t include is easily accessible drawers. Unfortunately, if you’re looking for storage units for your personal belongings or documents, you want to find this storage feature in this biometric gun safe. However, it does provide ammo storage for your specific guns that you may keep in the safe. The Viking VS-50BLX is secured physically through sturdy, steel material and finished with scratch-resistant coating and the door pry-resistant with seamless finish created by laser cutting technologies. This gun safe’s locking system will leave you feeling secure by its optical sensors, fingerprint readers, and digital keypad. It has a keypad that is programmable with a 4-8 digit PIN of your choice that lets you know the battery level and a deadbolt that is digitally accessed by a touch of a finger. The safe offers a sound system with the on/off mechanism and beeping when the door is left open for more than a minute, and the bottom of the safe internally is equipped with carpeting and lit with LED lighting. One last hidden feature about the Viking VS-50BLX is the memory storage it offers. It remembers up to 32 fingerprints and your PIN that you will use to access it. It offers a lockout mode for any unwanted visitors. This is activated through attempting the PIN at least five tries. In my personal opinion, when it comes to the Viking VS-50BLX safe is it passes the short-term security of guns, ammo, and documents that are involved in your life. It is positively rated for its easy accessibility when it comes to gun safety and short-term business documents. However, I do not see it being a very high-quality long-term safe for important documents you need to carry with you throughout your lifetimes such as birth certificates, social security cards, and saving bonds. You would be overall disappointed when it came to fire and water resistance if that comes down your path in life. This has been one of the best guns safe security reviews I have done on a safe of this quality. The Viking Safe Comes in a Variety of Sizes! If you’re not quite set on a VS-50BLX there’s great news! Viking makes their home safes in a variety of sizes; from the Mini Biometric Safe – the VS-20BLX to their Biometric Fingerprint Hidden Wall Safe the VS-52BLX. Pros: Good quality large safe, the biometric fingerprint scanner is outstanding, comes with bolts to mount to wall or floor, battery backup box and two keys incl. in-case of scanner failure. Cons: NOT a thick reinforced safe, no water or fire resistant. The Barska safe AX11650 has achieved a five out of five-star rating on some of the most popular consumer sites. Barska is one of the most trusted brands when it comes to building a high quality, large floor safe. It has become one of the biggest names in providing a very diverse line of high quality, biometric gun safes, floor safes, book safes, etc. The AX11650 is no different, with its optical scanner that uses a unique, bio algorithm to take encrypted scans of your fingerprint. This is just one example of why I love Barska’s safes. The biometric safe is honestly a great necessity to use to access your personal belongings easier and faster. 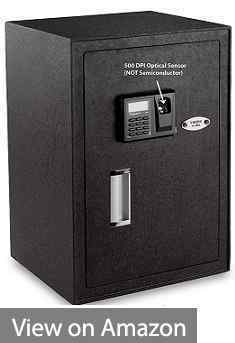 This safe is very dependable when it comes to quick access and the security in your mind for all your items such as important documents, expensive jewelry, and handguns. How it is easier to access, but still maintain safety is just pushing the power and analyzing your fingerprint. This large floor safe is capable of storing 120 fingerprints so multiple people that you trust can access it. The downside of this Barska large biometric safe is not able to protect your personal belongings against house fires or business fires. I don’t know about you, but I want my valuable items to be safe when it comes to my house burning down. You would think that steel would help protect you, but you would be proven wrong. The fire has always been a killer of anything created by man. It is one element that some products cannot fight. 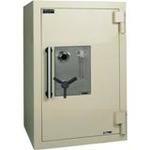 So with that being said, this safe is perfect for protecting your items on a short-term basis, not a long-term basis. This home safe is waterproof, and although it’s unverified, this remains the best overall safe on the market. If you’re looking for a safe that is specifically designed to be as waterproof as possible, then I suggest going with the First Alert 2.14 c.f. or the Sentry Safe SFW205CWB – which is water resistant submerged in 8 inches of water up to 24 hours. This particular competing home safe might look attractive, but I’d recommend the Mesa Safe over the Sentry Safe because independent research has deemed it to be superior. When I am shopping for a safe, I am shopping for durability. Barska large biometric safe nails it on this one. Not only do they provide a steel finish with scratch resistance to the exterior, but they also provide points for you to secure your safe permanently into the floor. The cool thing about this is Barska provides the hardware for you to set up your mounting system. The benefit of having the mounting system is to create security, so no one will be able to run away with your safe quickly. With your Barska biometric safe, it can last up to 2 years with just four AA batteries. You won’t have to worry about changing your AA batteries every few weeks to a few months. If you ever have any issues with your Barska, a warranty of one year is provided. Now that is what I call excellent customer service! Barska doesn’t let you down when it comes to high-quality storage for all your desired needs. This Barska biometric safe creates wide dimensions for all your items such as jewelry, important documents, and firearms. The safe provides two adjustable and removable shelves for propping any ammo, firearms, and important documents. For being a collector of firearms, I need to place my handguns in a secure location. The battery pack for the four AA batteries you need to use is entirely accessible on the inside of your safe. There are so many cool features when it comes to the Barska safe. Not only is it impact-safe, provided with mounting hardware, and finished with black steel; it has many technological features added. I know not many safes have this, but this one allows many different people to access it with just the touch of a finger. The fingerprint mechanism stores 120 fingerprints. I know we all struggle with technology and it isn’t perfect. So, there are two manual access points when technology chooses to fail you. With the mounting hardware, that allows for a protective mat to be placed underneath it. This protects against any tears in your luxurious carpeting or polished hardwood flowing you installed last week with pride. There are already drilled anchors into the hardware so you can mount your safe with ease. No more tearing your hair out with frustration when it comes to installing your Barska biometric floor safe. 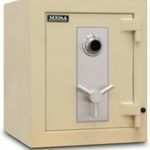 This safe has a lot to offer when it comes to protecting all your short-term needs, but not the long-term needs. I look for something that protects my personal items from water and fire. This one does not hold the attributes of being water resistant and fire resistant. The positive aspect of this safe is its impact resistant and the reliable biometric fingerprint scanner, which becomes very useful and convenient if more than one person needs access to the safe and/or the safe need to be opened several times a day. The BARSKA Safe AX Series Home Safes Comes in a Variety of Sizes! If you’re not quite set on an AX11650 there’s great news! BARSKA Safe makes their home security safes in a variety of sizes; from the HQ300 Biometric Keypad Safe to their Top Opening Biometric Safe with Fingerprint Lock. Buying a safe for domestic purposes is not as easy as it once was. You used to just walk into a hardware store or a locksmith, see only a few models available that almost all looked, performed and cost the same, pick a size, and that was it. Now buying a safe for the home usually, means search on Amazon or visiting you local home security store only to find yourself faced with an array of different options, classification claims, and price points. Suddenly instead of making a quick $100 purchase, you're considering forking out upwards of $5000 for a fancy steel box that might become an heirloom for your grandchildren. Choosing the right model is much more puzzling than selecting the degree of security. To help make this process easier we have compared different peril and design types, as well as the factors, used when evaluating and measuring a safes performance. For a more in-depth discussion on how to choose the right safe for your home, check out our ﻿﻿buyer's guide. Safes can be categorized into peril or style types. Falling under peril types are burglar safes and fire safes. As the name suggests, burglar safes are built to protect valuables against burglary, and fire safes are used to protect items from damage caused by fire and heat. Some manufacturers even offer combined, burglar and fire, options. Falling under style (or design) types are traditional box-shaped safes that can either or not be anchored to the floor, hidden floor and wall safes, weapons (specifically gun and rifle) safes, security lock boxes and diversion safes. Your choice will depend largely on the degree and type of protection necessary for the estimated value (both market and sentimental) of the items you are storing, the final placement of the safe, and price you are willing to spend. You should also consider how easy the lock is to use and whether you need portability. If you weren't aware already, there isn't a safe in the world that can't be penetrated. Someone with enough time, the right skills, and proper tools will eventually get inside. The objective is to deter, prevent and delay burglaries. Underwriters Laboratory, a global leader in certifying, testing and inspecting products, employ teams of testers with specialized skills ranging from brute strength to mechanical experts using a number of with high-end portable tools, torches, and even explosives, all as part of the process of testing, evaluating and certifying safes with performance/burglary-resistance ratings. According to Underwriters Laboratories test evaluations no matter what the safe, most are opened in under 15 minutes. Very few safes took up to 30 minutes to open, and even fewer take up to an hour. This isn’t to suggest that your average thief would get anywhere near those same results, it simply serves as a benchmark for the quickest time industry experts were able to open the safe. While most home and fire-resistant safes do not have an independently tested burglary classification ratings, they do provide some degree of protection against unauthorized access. Features such pry-resistant doors, solid steel construction and larger deadbolts including the number of bolts, all help make a better quality, more secure home safe. Also anchoring a safe to the floor or wall can further deter thieves in a hurry. In light of some reports that approximately ‘25% of people will fall victim to a house fire that will require fire fighters to intervene’, it is worthwhile looking for a safe for the home that has a fire rating. While many fire safes on the market offer little resistance against burglary and visa verse, there are a couple of models that offer both. Usually the top of the line brands manufacturer home safes to withstand exposure to fire for up to 30 minutes or more. This should be plenty of time to ensure your valuables remain undamaged before emergency services are able to respond. Examples of some models include the Mesa Safe MBF1512C, SentrySafe SFW205CWB, and First Alert 2096DF. Traditional security in-home safes are the type of safes we focused on in our review. They are the classic designs; usually, a bit bigger than your standard hotel safe with at least one shelf, sometimes even two or three shelves inside, offering better storage. While the tradition cabinet safes were usually those that you open using a combination dial, these days safes are built using a number of different locking mechanisms including combination dial lock, electronic, and biometric fingerprint, and key lock safes. Cabinet safes generally secure by mounting to the floor via factory pre-drilled anchor points. The biggest advantage with wall safes is their concealment. They tend to be smaller than home floor safes in terms of storage capacity and, depending on the model, can be easily wrenched and pried out of the attached wall, and carried in an over the shoulder fashion by just one person. They excel for short-term storing of valuables or when you have items that should be kept away from children. While at first, it may seem like an awesome idea – having a hidden wall safe just like in movies, most buyers of such safes typically express some degree of ‘buyer’s remorse’; often saying something to the effect of “can hardly fit anything - should have just bought a normal safe”. In almost all cases, the bottom line is that wall safe designed for your average size home, lack adequate storage capacity to justify spending the money. Unless you own a mansion, or already have a home floor cabinet safe and need an additional safe with greater concealment, then there are much better safes you can spend your money on. It should be noted that if choosing to put a hidden wall safe in your house, it is highly recommended that first - you know exactly what you want to store in the safe before buying it. That way you have a less chance of getting the wrong size for what you need it for; and second, you have a profession carpenter install a false wall in which the safe is mounted onto. This will add to its concealment, and minimize damage to your home if attempts are made to rip it from the wall. In the picture above are your typical wall safes. A Biometric gun safe: These can lock and open based on fingerprints identification. These are designed in a high tech manner which is why they cost more than the ordinary ones and are equipped with anti-drilling steel plating that can prevent unauthorized access. The only problem with low quality biometric gun safes is that they have a high rejection rate and can at times refuse access to the user as well. Electronic gun safe: Is a secure way of keeping your gun actually safe in an enclosure that runs on battery or electricity. An electronic keypad keeps it extra safe with 4, 5 or even 6 coded numbers which make it difficult to pry on. However if you share the code with unknown people they can get easy access to it. Vehicle gun safe: A gun has to be stored safely in a vehicle as much as the house. This is why vehicle gun safes have come into the picture that is durable, unbreakable and have a locked casing. Wheel and pin combination: Remember the ones we see in retro movies, yes this is a conventional gun safe that can be operated with a combination of usually 3 numbers. These are fire and flood resistant which is the reason why they still have a market. The problem with these safes is that the number dial may skip numbers many a time. Key lock gun safe: These are used for additional security purposes with a combination of locking systems like a digital keypad with biometric one. It may look difficult to some but you get a hand of it, things will certainly turn out to be different. Multiple lock gun safe: These have a simple-to-use lock and key gun safes that can operate unperturbed. Better quality ones can resist natural calamities like flood and fire. The problem arises when you misplace the key but a call to a locksmith can take care of that within minutes. Every safe manufacturer has a different security scale, as do independent security certification organizations, like Underwriters Laboratories, that are popular references for safe classification standards. While security held the most weight in our review, not everyone needs the same level of security out of their safe. For example, a person storing important documents and a few collectibles that has, and uses, an alarm system for their own may not need as much security as person securing the same kind of items inside their urban house that is not fitted with an alarm or surveillance cameras. We looked at products that we consider to be a deterrent for lesser skilled thieves than say those that offer some degree of resistance against an angle grinder or high-speed diamond drill. Overall all of the safes we assessed and feature in our top 5 list certainly keep your valuables more secure. All being quite difficult to pry open with a crowbar or similar hand tools due to their pry-resistant hinge bar, which reinforces the door of each safe for added protection against theft. However, the MBF1512C, SFW205CWB and 2096DF provide greater and more reliable and protection against burglary than the Viking Safe VS-50BLX and BARSKA Safe AX11650 due being ETL verified for impact resistant; meaning they can withstand a drop from two stories. In other words, even if the safe falls or is thrown from a height of two stories, each of these three safes should still function and remain closed. All of the assess have between two to six bolts, and all of the bolts are 1-inch thick steel, making the door harder to force open. All of the safes we assessed are constructed from steel, but some are able to withstand the threats posed by burglars better than others. We prefer models that weight more because they are more difficult to carry away if they aren't bolted to the ground. The Mesa MBF1512C, Sentry Safe SFW205CWB and First Alert 2096DF all weigh more than 120lbs, which probably require more than one person to move. Some of the safes are much lighter and easier to carry, like the Viking Safe VS-50BLX and BARSKA Safe AX11650. This did not give us much confidence in their level of protection against burglary. How to Choose the Right Safe for Your Home? Do you think you could easily go out to the market and buy a house safe simply with the points covered in the reviews above? Almost certainly not! What are the size requirements for your safe? Do you intend to store a few items, or do you have lots of valuables you need to secure? How big is the biggest item you are storing? What are the total market and personal value of the items you want to be stored? It makes no sense to keep $10,000 in a $100 safe. Buying the wrong safe can often be avoided by simply knowing the size requirements for the inside of your safe and the value of the items you are securing first. Where will the safe be kept? Here you want to get a sense of what are the exterior dimension requirements of the safe? How much can it weigh and still safely be moved into place? Will the floor hold that weight of the safe including whatever item you want to store in it? What lock type should you choose? This question is best answered by first determining how often will you need to gain access to your valuables. Will it need to be opened every hour, in which case an electronic lock or biometric fingerprint safe might be preferable, or once a month, in which case a simple, less expensive dial combination lock safe might be suitable? You'll also want to determine if more than one person will be using the safe, and if so, how many? Does the safe need to have multiple combinations and an electronic tracking system? Are there any benefits to getting a safe with a higher security rating? 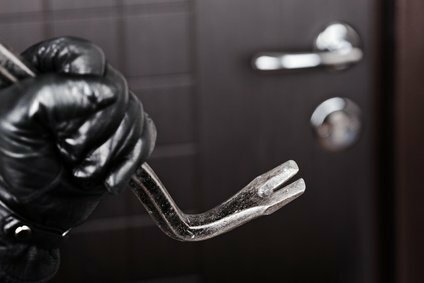 If you live an area with a high crime rate, particularly break-ins, your insurance premiums can be significantly reduced based on a higher UL performance rating. How far away is the nearest response to an alarm signal? If you live in a remote area where the fire department response time takes more than 30 minutes, you probably need to go with a higher rather than lower fire rating. Choosing a safe that can secure digital files, important paper documents, keys and other valuable items can be a struggle, especially if when you need to get a good value for your money at the same time.While you may be tempted to pick any safe for your home, you'll find that the best safes for home use aren't necessarily the most expensive one. Every house safe provides unique features. Do not choose one just for the sake of getting one because you have a few valuables you would like to store and protect. Take a close look at the different features and options of each different type of safe and determine whether or not they fit your personal needs. At the end of the day, if a safe keeps its items safe and secure then that’s all that matters. However, you may require specific features, which is when due diligence is necessary. Just remember to always also ask yourself the questions set out in the guide to buying the best home safe 2017, and ensure that it meets your needs. >> Check out all top rated safes available on Amazon.